Dr. Welch offers braces, clear aligners, and more orthodontic treatment options to straighten teeth and create confident smiles. Call 1-800-32-SMILE to schedule a complimentary consultation. I enjoy getting to know my patients and watching them transform from self-conscious to self-confident as their smiles become straight, healthy, and beautiful. Call 1-800-32-SMILE to schedule a complimentary orthodontic consultation and discover how there are more options than ever to correct problems such as buck teeth, crowding, cross bite, gaps between teeth, and jaw misalignment. Patients will leave their first appointment with a clear understanding of how braces or clear aligners could transform their smile, how long treatment should take, and how the cost can be worked into the family budget. The American Association of Orthodontists recommends children receive their first orthodontic consultation by age seven to spot any problems with jaw growth and emerging teeth. However, orthodontic treatment is not just for kids anymore. One in five orthodontic patients is an adult. “I enjoy getting to know my patients and watching them transform from self-conscious to self-confident as their smiles become straight, healthy, and beautiful,” Dr. Welch said. Dr. Welch has been a Floridian since 1999. She obtained her undergraduate degree in Civil Engineering and Micro & Molecular Biology from the University of Central Florida in Orlando. 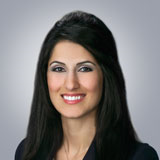 She earned her Doctorate of Dental Medicine degree from Nova Southeastern University in Davie and completed her advanced training in orthodontics at Jacksonville University where she served as chief resident and president of her class. Dr. Welch is a member of the American Association of Orthodontists, Florida Association of Orthodontists, Florida Dental Association, and American Dental Association. She is bilingual in English and Farsi.